Last month it was my tenth wedding anniversary and so a couple of months before I started to rack my brains on what to get my husband. I wanted it to be unique and memorable. A card and a box of chocs would simply not cut it. So I decided on a Tiger Moth flying experience from buyagift. 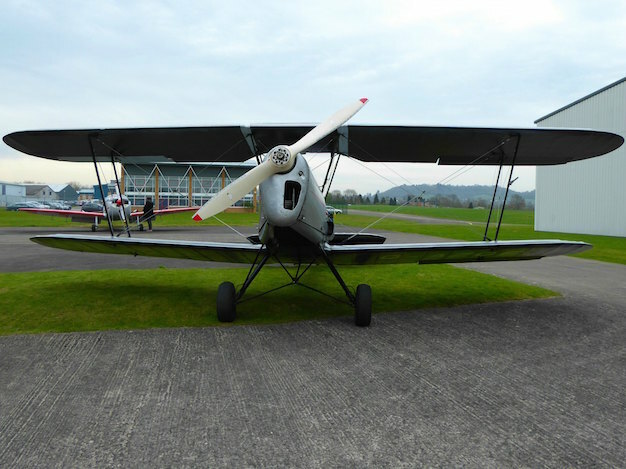 A bi-plane, the Tiger Moth was operated by the Royal Air Force from the 1930s to the 1950s primarily to train pilots. 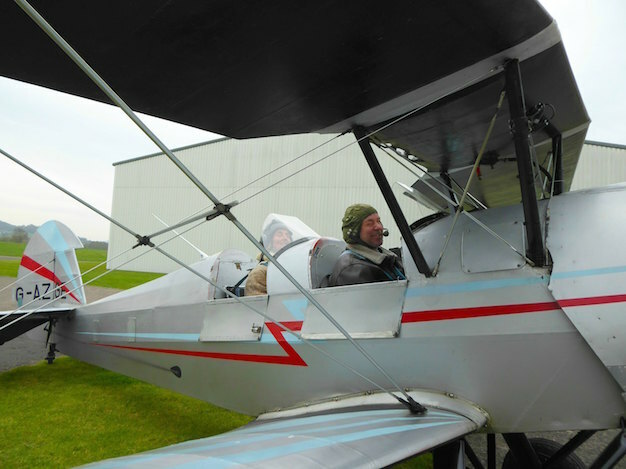 My husband is learning to fly and when I presented him with this Tiger Moth experience gift on holiday he was really surprised and very excited. A memorable experience, never forgotten. Experiences like this last longer than material things, you won't be talking about the phone you bought in 2016 when you are old and grey but you will remember the time you went up in a Tiger Moth and did a loop and roll! Yes, this was what was in store for him. The booking process was simple - he entered his details online and then rang the aviation company in Gloucester, Tiger Airways. So a month later we set off for Gloucester airport. Firstly he watched a DVD to know what to expect. The film showed you what not to touch, the basic controls and how not to put your foot on the plane! Yes indeed, something I didn't know was that the plane was made of wood and canvas! After meeting the lady pilot and going over a few instructions he donned a leather jacket, a hat and goggles like Biggles and climbed into the front open cockpit of the bi-plane. A headset kept him in touch with the lady pilot and he was strapped in with a four-point harness. After taxying on the grass airstrip, then picking up speed, they had lift off, soaring like eagles gliding on the air. When airborne and away from the airfield she let my husband take control of the plane to turn left, right and climb then she retook control and asked if he wanted to do a loop. So he did. He's certainly braver than me, flying upside down in an open cockpit plane, that's for sure. So they went into a dive to pick up some speed and then they looped. The experience was, less scary that he thought before he knew it he was looking at the floor, then they were upright. After flying some more, the pilot asked if he wanted to try something else and they went into a victory roll. This is when you roll sideways in a complete loop otherwise known as an aileron roll. This felt more like a ride at a theme park, except at 3000 feet rather than a few hundred, with the wind rushing past his face, a real adrenaline rush. Then he took control again and was directed back to the airfield where she took control and landed the plane. "It was a great experience, a bit chilly though but thoroughly enjoyable"
After the experience, he was given a copy of the photo taken earlier and there was an opportunity to have a DVD of the experience. 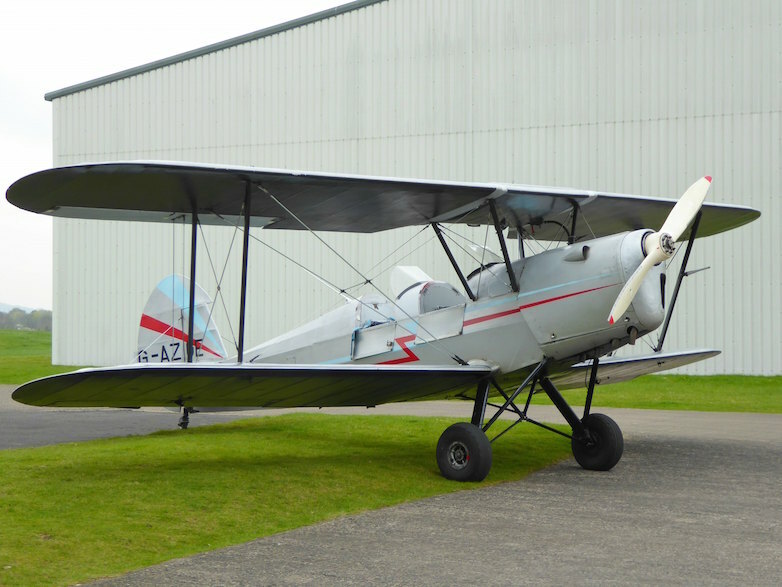 If you think you or a loved one would like to try the Tiger Moth experience I would recommend getting it from buyagift as the process of booking was simple and straightforward and they offer free exchanges too if you or your recipient change their mind. Flying a Tiger Moth plane was one gift he will never forget, great memories that will last a lifetime. I didn't manage to capture his acrobatics but here is a little video I made of the experience. Tell me, would you or a loved one like to try this? Have you ever given a gift experience? Oh my!What a gift! You truly have the knack of giving great gifts, your hubby must have been delighted. I personally would of been a bit scared and would of had a fake illness. Joking aside it sounds like you had a great day and I really love that you can get a photo and a dvd to remember the day. Don't get me wrong I love new gadgets, my Iphone is the best but experiences like this bring people together talking and remembering. We went in a helicopter, like you, over the Grand Canyon and that was a great experience too. I was slightly nervous but it was brilliant. Yes, I'm with you on this one The London Mum but he loved it! wow what an amazing gift, i bet he had an amazing time. This is an amazing gift idea! It was really excellent and he loved it. What ana amazing experience, it must have been exhilarating. Wow this is a lovely gift. It looks like a lot of fun. My husband and I always try to buy each other experiences now, rather than gifts. They are so much more fun. They are and you keep taking about it for months, even years later. He has driven luxury cars before too with buyagift and that was amazing as well. What a cracking idea for a gift. Made of wood and canvas though - eep!